Measurement of the soluble fms-like tyrosine kinase 1 (sFlt-1)/placental growth factor (PlGF) ratio may be clinically useful to discriminate systemic lupus erythematosus (SLE) from preeclampsia. Here, we present a pregnant woman with new-onset SLE with hypertension, with the measurement of the sFlt-1/PlGF ratio during pregnancy. A 31-year-old Japanese nulliparous woman, who had been diagnosed with idiopathic thrombocytopenic purpura at 10 years, had a systolic blood pressure of 120 mmHg and was negative for proteinuria at 12+1 weeks. Since her blood pressure increased to 159/86 mmHg with 3+ proteinuria at 25+4 weeks, preeclampsia was suspected. Deterioration of the kidney function (creatinine: 0.58 mg/dL at 24+6 weeks to 0.83 mg/dL at 33+6 weeks) necessitated cesarean section at 33+6 weeks. After delivery, she still showed increased creatinine and proteinuria. Therefore, she was transferred to a nephrology specialist in a tertiary center and was finally diagnosed with SLE with lupus nephritis class IV-G(A) (diffuse lupus nephritis). The serum levels of sFlt-1 and the sFlt-1/PlGF ratio, which are usually elevated in preeclampsia, were within normal reference ranges at 27+6, 28+1, and 28+6 weeks of gestation, although the serum levels of PlGF were slightly lower than the normal reference range. In conclusion, measurement of the sFlt-1/PlGF ratio may be clinically useful to discriminate lupus nephritis from preeclampsia. We thank Roche Diagnostics K. K. for the offer of reagents (sFlt-1 and PlGF), and the measurements of sFlt-1 and PlGF conducted free of charge under collaborative research with Roche Diagnostics K. K. (I-12-78.) 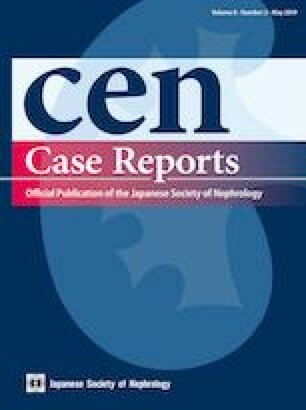 Toshimitsu Ohtani, Kanako Nakamura, Chihiro Kamosawa, Keizou Yoshida, and Hideki Yano of Nasu Red Cross Hospital contributed to the detection and diagnosis of SLE. All procedures performed in studies involving human participants were in accordance with the ethical standards of the institutional research committee at which the studies were conducted (IRB approval number: I-12-78) and with the 1964 Helsinki declaration and its later amendments or comparable ethical standards. We also obtained written informed consent for this case report from the patient. We also obtained written informed consent for this case report from the patient.